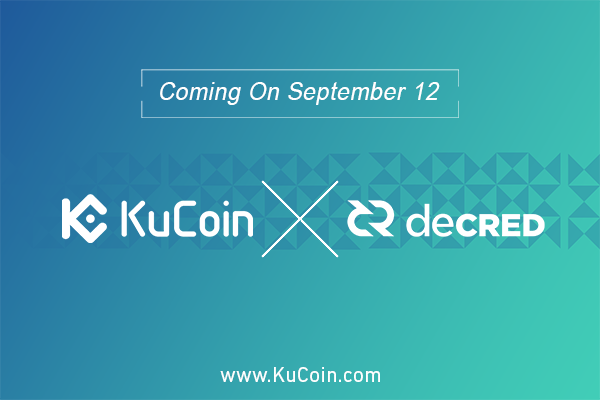 Decred (DCR) token is now open for deposit with trading pairs DCR/BTC and DCR/ETH. Buying starts at 19:30 UTC+8 while selling and withdrawal at 20:00 UTC+8. All trading transactions are done utilizing KuCoin’s Android and iOS apps, or through their official website, www.kucoin.com. Decred (DCR) is a cryptocurrency that directed on the decentralized governance and decision making on the blockchain. The objective is to build a cryptocurrency that works autonomously, with advances voted on and appointed directly by the miners and holders of the currency. Decred includes some fundamental modifications from the Bitcoin protocol that it’s based on to achieve these decentralizing goals. What does Decred strive to solve? Decred’s developers are crypto-enthusiasts and early Bitcoin adopters, but they detected incapability in the way Bitcoin operates. As mining operations have developed, Bitcoin’s decision-making process has become more centralized, with the biggest mining businesses holding large amounts of power over the Bitcoin development process. Also, while some Bitcoin improvements can be achieved via a soft fork, almost all upgrades that include a meaningful change to the Bitcoin software need a hard fork from the old blockchain. – An innovative hybrid proof-of-work (PoW) proof-of-stake (PoS) consensus voting system. – A censorship-resistant blockchain-anchored public proposal platform. – Smart contracts that work such as Lightning Network. – Cross-chain atomic swaps between different digital currencies. – Cross-platform wallets for ease of use.